Girls I'm going to let you in on a little secret, remember when Beyonce asked who runs the world? I think she joined forces with Sophia Amoruso on this one, because either way here we are talking about a mighty #GIRLBOSS. Like I said in my last book post, give me a woman and a pair of shoes and I'm all over it, or in this case, a woman and a multimillion dollar clothing business and I'm practically hugging the book. Anyway, I'm sure you have all heard of Nasty Gal, well that is all Sophia's doing. From dumpster bagels to shiny Porsches, she lets you in on it all. Like a mumma to us all, she gives advice on life in general and tells you how to do it right, #GIRLBOSS style. Referring to yet another song, I can only imagine Drake's "Started from the bottom now were ERE" could be her soundtrack (highly gangsta and all) but she literally started from nothing and built up her fashion empire around her. It's some pretty impressive and inspiring stuff. It makes you want to get up and go start something amazing because it is actually possible, WHO'D HAVE THOUGHT?! So even if you are not a book worm, I would still highly recommend this witty, inspiring book, where the task of grabbing life by the balls will be at the top of your to-do list. So now when Beyonce asks who runs the world? 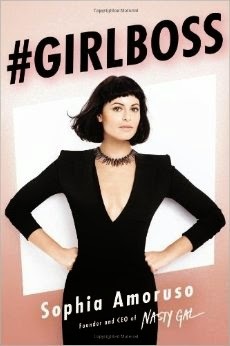 we can firmly raise our hands and reply GIRLS because #GIRLBOSS is proof that we rule!